Like most of the other white middle class American males born in the ‘50s, the only black gospel music I heard growing up was “Oh, Happy Day,” a 1969 hit by the Edwin Hawkins Singers and Paul Simon’s “Loves Me Like a Rock” (1973), which featured the Dixie Hummingbirds. I’d never heard the stuff live until I moved to Austin in 1984. Margaret Moser and the folks from the Austin Chronicle were enamored with a group from East Austin’s St. James Missionary Baptist Church called the Golden Echoes and helped get Junior Franklin and the Bonner sisters booked at Soap Creek Saloon’s South Congress incarnation. When South by Southwest started in 1987, the Golden Echoes sang before the keynote speech. member of the Paramount Singers) E.M. Franklin, Junior Franklin was a founding member of Los Angeles-based Mighty Clouds of Joy, a prime influence on the Relatives and Jones Family Singers. After that initial exposure, I started listening to any traditional black gospel music I could get ahold of. Wanting to know more than what was available about such Texas gospel acts as the Soul Stirrers, Washington Phillips, Blind Willie Johnson, Bells of Joy and Arizona Dranes, I started doing primary research. If I’m not on assignment and just listening for pleasure, chances are good that I’ve got Mahalia Jackson, the Swan Silvertones, Reverend Louis Overstreet or another spiritual R&B group blaring. Can’t get enough of the stuff, and it all started with the Golden Echoes. Can’t wait to hear Jackie Bonner Calhoun and her sisters and friends reunite as the Golden Echoes Saturday at 9 p.m. at the Carver Museum Theater. The SXSW showcase is free and open to the public. Also playing Saturday are the Durdens, Warrior Gospel Band and Jackie Calhoun and Deliverance. There’s plenty of free parking. On Friday, this second annual SXSW Holy Ghost Party! Kicks off at 6 p.m. at the Carver with Aservant from Waco. 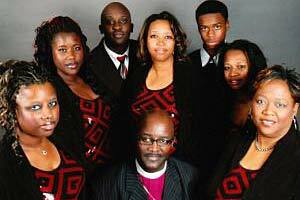 At 7 p.m., the Peterson Brothers’ Staple Singers tribute band, the Stapletones will take you there, followed by the Jones Family Singers and then the Gospel Stars to cap it off. By the weekend, you may have had enough of the traffic, the corporate encroachment, the drunks, the badges of SXSW. Gospel at the Carver offers a respite. Or a recharge. Drop in to hear where soul music and rock n’ roll started.